Any items of personal nature (i.e. Food & Beverages other than Normal meals provided by us, Telephone Calls, Consumption of Mini bar, Laundry etc). Dept to Delhi by Pashcim Exp. O/N journey. Arrival in Delhi & Dept to Haridwar. (06 hrs journey from Delhi to Haridwar). In the evening arr at Haridwar. Overnight at the hotel. Early morning dept to Massoorie to see Kempty water falls. On the way take breakfast. Visit Kempty Water falls at Massoorie Ghaat. Proceed to Yamunotri. Stay at the hotel near Yamunotri. Early morning proceed to Yamunotri. (bus takes halt 5km from Hanumanchatti/ Jankichatti). After Darshan stay at the hotel in Yamnotri. Early morning after brkfast proceed to Uttarkashi. 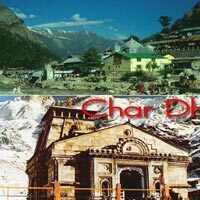 (Yamunotri to Uttarkashi 05 hrs journey.) Check into the hotel. & visit Kashi Vishveshwara Temple. O/N stay at Uttarkashi. Early morning depart to Gangnani. Enjoy bath at hot water springs at Gangnani. (it takes 2.5 hrs to reach Gaganani). Dept to Gangotri. On the way visit Bhairavghat. Proceed to Gangotri (Bhairavghat to Gangotri 13 Km). After Gagotri Darshan again come back to Bhairavghat. O/N stay at Uttarkashi. Early morning dept to Rampur (12 hrs journey). On the way visit Tehri Dam. O/N stay at Rampur. Early Morning dept to Gaurikund. Take bath at Gaurikund and proceed to Kedarnath (16KM by walk or u can travel by Doli/Hourse on self expense). It takes 4hrs to reach Kedarnath. O/N stay at kedarnath. Early morning Kedarnath Darshan. Back to Gaurikund. O/N stay at Rampur. Morning after brk fast proceed to Badrinath. O/N stay at Joshi Math. Early morning dept to Badrinath. It takes 03hrs from Joshi Math to Badrinath. Take Badrinath Darshan. Also visit Bhim Sheela, Vyas Gumfa, River Saraswati. Have lunch. Evening arr at Rudraprayag/Shrinagar (in Uttaranchal) & O/N stay. Morning dept to Haridwar. On the way visit Lakshman Jhula at Hrishkesh. Evening arr at Haridwar. O/N stay at Haridwar. Morning after brkfast proceed for sightseeing. 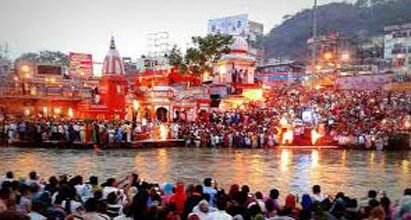 See Ganga Aarti at Har ki Pauri, Manasa Devi. Evening free for shopping. O/N stay at Haridwar. Early morning dept to Delhi. Afternoon arr at Nijamuddin and proceed to Mumbai by Paschim Exp at 5:00pm or any other connecting train. In the afternoon arr at Mumbai with glorious memories.